(San Jose, CA) ComicBase, the world’s leading comic book collection management software, is the first commercial PC product available in the new Blu-ray format. The program, which allows collectors to easily log, track, manage and even sell their comic book collections, comes with both a DVD full of movie trailers and creator interviews and now a Blu-ray disc full of over 150,000 comic cover images from the late 1800s to the modern day. Human Computing, which makes the software, has been following the development of the format with eager enthusiasm—and now relief. 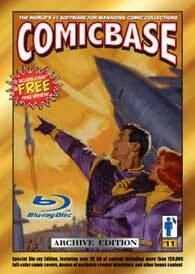 The ComicBase Blu-ray Archive Edition is available at the company's product website, www.comicbase.com for a retail price of $399, and includes both a year of downloadable price and title updates, as well as four Blu-ray-based updates to the picture library, delivered quarterly. ComicBase is also available in other formats, including the $44.95 ComicBase Express, the 2-CD, $129.95 Professional Edition, and the 2-DVD, $299.00 Archive Edition.